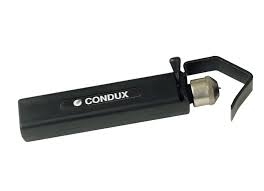 Condux offers two sizes of the Stripper/Slitter for easy and rapid preparation of round cables from .18 (5 mm) up to 1.42 inch (36 mm) in diameter and 8 AWG up to 500 kcmil. They feature a spring-loaded cable support arm with a beveled leading edge that assists with insulation removal. The blade swivels to facilitate circular, longitudinal and spiral cuts.